Home / Stock Picks / Hot Stocks / Funko Stock: After the Big Drop, Is It Time to Buy? Funko Stock: After the Big Drop, Is It Time to Buy? Funko (NASDAQ:FNKO) stock has been a very fun name to trade so far this year. It’s made huge moves and has actually given investors a pretty reasonable trading setup. Funko stock went public in November at $12 per share, but got off to a very rough start. 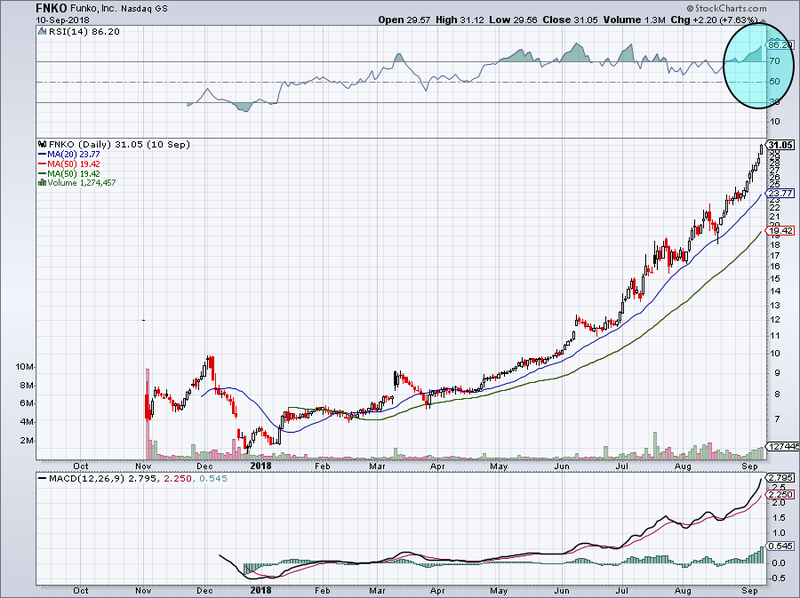 In fact, FNKO shares lost about 50% of their value and didn’t recover back to the $12 mark until June of this year. Now though, the stock is up 150% from that IPO price. Monday’s 7.6% rally put an exclamation point on the most recent rally too. However, many were caught off-guard when shares plunged on Tuesday, falling nearly 18%. Funko makes collectible figures and products for all sorts of entertainment segments, like TV shows, movies, video games, musicians and sports teams. Last quarter, the company entered an agreement with Pokemon and Fortnite, the latter of which is one of the hottest video games of 2018. Fortnite has become famous for its cross-system capabilities and its battle-royale play mode. Fueling FNKO stock’s Tuesday decline seems to be concern over the positive beta reviews for Activision Blizzard’s (NASDAQ:ATVI) Call of Duty: Black Ops 4. The franchise is including a battle royale mode as well and if demand for Fortnite wains as a result, so too could demand for Funko, hence the big decline. While we were all over Tuesday’s move, as the chart above shows, we were not expecting a 17.8% decline to ensue when we articulated the article. Fortunately, the thesis we lay out below still stands, surprisingly. Let’s go back to what we thought on August 13th, because a lot of what we had to say then still applies now — even after Tuesday’s precipitous decline. Keeping it simple remains the best strategy with Funko stock, which did test the 20-day moving average a few days later. While it initially broke below this key mark, those losses didn’t hold for a full day, as shares reversed off the lows and closed higher on that session. It’s been in rally mode since. Shares were up over $31 apiece Monday, while the 20-day moving average is down below $24. That’s a fairly wide distance between the two and it has us taking notice. Further, Funko stock had an RSI reading of 86 (blue circle), suggesting that shares are quite overbought in the short-term. Buyers who have been wanting in and aren’t scared off by the big decline can consider buying if FNKO tests and holds the 20-day. Otherwise, we’ll have to see how the 50-day does. Remember, keep it simple and don’t be a hero. If it can gain momentum going into the second half of this year, FNKO could have even more upside than we’ve seen. As a result, expectations have been drifting higher. Analysts still expect Funko to earn 23 cents per share this quarter. However, they now expect the company to earn 68 cents per share for the full year, up from just 63 cents a share two months ago. For 2019, consensus expectations call for earnings of 92 cents per share, up 10 cents per share over the same time period. Should Funko stock achieve those figures, it will represent 385% and 35% earnings growth, respectively. On the revenue front, analysts expect 23% growth in 2018 and 14% growth in 2019. I wouldn’t say it should be enough to make Mattel (NYSE:MAT) or Hasbro (NYSE:HAS) nervous, but FNKO stock may be one that management wants to keep their eye on. Especially if the company can prove that there is sustainable growth in its product line vs. being a short-term fad. That will be important going into the holiday season, particularly as worries escalate on Fortnite competition. My issue with FNKO stock at this point is forecasting and volatility, as it’s tough to look too far into the future with this name. While things are going well now, let’s remember the stock has had a good run too. That is, until Tuesday. Let’s see how the 20-day and possibly the 50-day moving averages hold up. Bret Kenwell is the manager and author of Future Blue Chips and is on Twitter @BretKenwell. As of this writing, Kenwell did held no position in the above stock. Article printed from InvestorPlace Media, https://investorplace.com/2018/09/trading-funko-stock/.